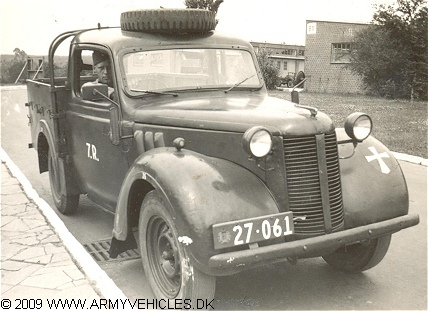 Danish Army Specific: Another example of a vehicle bought from the British Forces in Germany just after WW II. Used to carry passengers and light cargo, running errands and other general-purpose work. The Austin was replaced in the late 1940´s/early 1950 by Willys MB/Ford GPW. Historical: The Austin Series G/YG was developed in late 1939/early 1940, patterned on the Austin 10 HP four-door Saloon. It served in all 3 services during and after WW II. Different from the civilian version were the engine, the fitting of a water pump, lower gear ratios, larger petrol tank and the use of tyres of the "cross country" type in the tread and of larger section than normal. Three hoops supported the removable tilt, early versions of which incorporated an opening front section to enable a crewman to pop up and operate a Bren gun that could be rested on the spare wheel bolted to the cab roof. Several changes were made in production in the interest of improvement, standardisation and simplification. The wooden tailgate was replaced by a pressed steel version and the five-window tilt had to give way to a simplified three-window version from late 1940. The number of slats in the radiator was reduced from 27 to 18. Later a split top cab was introduced so that the overall height could be reduced for transportation. The first 250 vehicles was powered by the same 1.125 cm3 engine as used in the Austin 10. Approximately 30.000 vehicles were produced from April 1940 - 1944 by Austin Motor Co., LTD, Longbridge in Birmingham. Similar models were produced by Morris, Hillman and Standard based on the manufacturers contemporary 10 and 12 hp passenger cars as the armed forces were desperately short of vehicles. The type was nicknamed "Tilly", as the official designation was "Car, Light Utility, 4 x 2". Length: 3.96 m (156 inches). Height: 1.93 m (76 inches). Weight: 1.514 kg (3.330 lb.). Engine: Own 4-cylinder, type G3-222AB (and variants), 1.237 cm3 (75 cubic inches) displacement, carburettor, liquid cooled. Horsepower: 29 at 3.600 rpm. Fuel capacity: 38 liter (8.5 gallons). Additional: Other known users are Portugal and the Netherlands.